To make your strategy stick, you will need lots of stories for people to tell that illustrate the strategy in action. 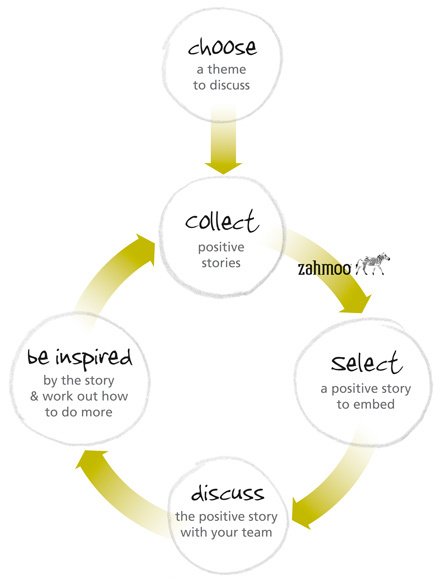 Embedding Positive Stories is our method for creating a systematic process for finding and sharing these stories across your organisation. Every day, in every Apple retail store across the world, all the employees gather to talk about the net promoter scores collected the day before. If someone gets a high NPS, the manager calls it out: ‘Hey everyone, Jenny got a great NPS yesterday’. The staff members clap. The manager then wants everyone to know how this was achieved: ‘Jenny, can you share with us what happened with that guy who came in with the iPad mini?’ So Jenny tells the story of the great service this guy received. Because Apple’s employees are regaled every day with stories of great customer service, they all know what it looks like. They’re not forced to remember so-called inspirational posters with corny customer service acronyms. Instead, they get praise from their managers – and they get the chance to tell their colleagues the concrete details of what happened. We can set up a similar process that fits in with how you work.